Whatsapp is all set to launch ‘Video Calling’ feature – Screenshots Leaked! After successfully launching calling feature which has got lot of popularity, whatsapp is ready with the most awaited feature “Video Calling” and According to the leaked screen shots of the feature, It is all set to launch it in the next software update. Ironically this new feature in Whatsapp messenger will give a tough competitions to video calling apps like Skype and IMO. 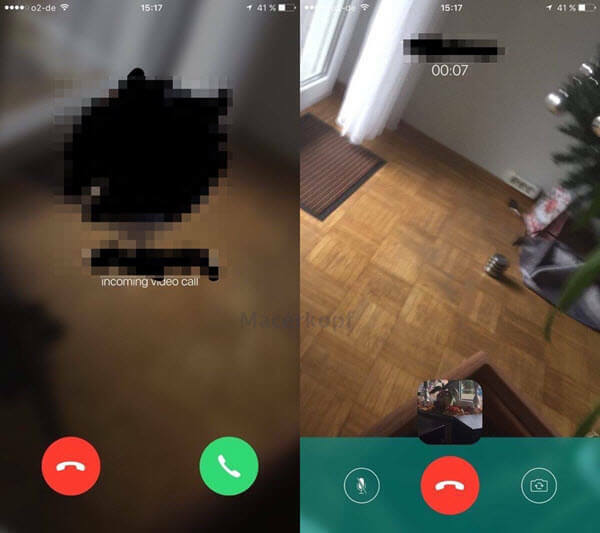 Reportedly, A German tech blog has posted a Screenshots of a video call that was made on the popular messenger having over 900M users. The feature has a very clean UI that is relatively simple and impressive at the same time. With this most awaited feature in Whatsapp, i am pretty sure that it will pile the pressure on Apples FaceTime and Microsoft’s Skype. But Unlike Skype, Video Calling feature on Whatsapp will be limited to your friends and family (Your phone contacts). So if you would mind sharing your phone number with strangers, you better stick to Skype. Though if you only video call your close-ones, The new feature in Whatsapp is win for you. If the German website is to be believed, In addition to video calling, a new tabbed interface is being tested in the second notable shakeup of the messaging app’s UI in the last year. How to Activate Video calling feature? Beware! Whatsapp has not yet officially announced about the new feature, But its evident that it will launch it very soon. Meanwhile there are lot of websites claiming to activate the feature using 3rd part apps (.apk file). Stay away from such website, you will end-up installing adwares on your phone. The only way to experience this feature first, is by downloading the latest version from official whatsapp website. Please note that the latest Update of the app is first made available on the official website before it gets pushed to app stores. So its always a good idea to keep an eye on the website for the latest version. With Whatsapp’s video calling feature, You will be able to call your friends anywhere in the world for free as long as you have a Wi-Fi network or an effective data plan on your registered number. Dual WhatsApp Trick – GBWhatsApp version 4.7 is here!